A tough task for the U12 girls was ahead in a cup fixture v RHS U13 team. The squad embraced the challenge and goals from Amie (3), Ishani (2), Eliza, and Emily P ensured a well earned victory away from home. 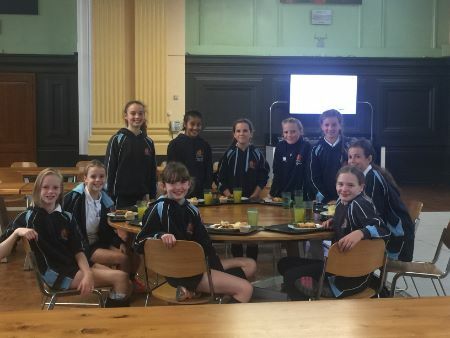 The year 8 girls were in Cumbria so the ‘young ones’ had to step in and they did so without fear or apprehension after listening to Mr Gall stating that they could be victorious if they stuck to the game plan and supported each other. Even he was surprised at the energy and level of improvement to set up a magnificent victory against a challenging opposition. Ipswich produced excellent passages of play to produce good opportunities and march forward into the next round. The umpire said that it was a game of real quality and an encouraging insight into the level of young athletes that are being produced. The victory was celebrated with Jack, the foxy looking dog, being cuddled by the whole squad, at the same time and then being released by Tilly who thought it best for him to have his freedom! Jack did come back to the arms of the squad after a crazy chase and an easy peace returned to this fabulous group of girls. Great support from our parents again too.